The original Broadway cast recording of 1953 sets a tall order for subsequent recordings. Certainly others have been fuller, have included music jettisoned from this first ever recording, and have included starry (sometimes operatic) names. One thinks especially of the full operatic version with Samuel Ramey, Ruth Ann Swenson Jerry Hadley and Julia Migenes Then, more pertinently, there’s the MGM soundtrack which you can find on Warner, which has the all-star cast of Howard Keel, Ann Blythe, Dolores Gray and Vic Damone. But for many, perhaps for most, the Broadway cast still preserves the immediacy and allure that elevates it, collectively, above all others. First recordings of course often have that effect, and this one no less than others. Foremost amongst equals is Alfred Drake. He copes with demands stentorian, poetic and patter with equal aplomb. And he’s able to absorb the rather gauche Gilbert and Sullivanisms of Rhymes I Have (a late addition to the show) just as much as he’s able to put across something like The Olive Tree, which derives from the Prince Igor trio. Joan Diener makes a splendidly sassy contribution. Others have sought more introspection or perhaps more poetry – but none have really measured up to her. Just hear her in all her glory in Not Since Nineveh. And then there’s Doretta Morrow whose every appearance is a delight, the voice perfectly suited to this material. She joins with suave Richard Kiley for the show’s standout number, courtesy of the Polovtsian Dances, Stranger in Paradise. But there are no weak links in this cast – as there have been in others, especially the more recent ones, where comic turns have soured things. Borodin’s tunes sound pungent and warm. 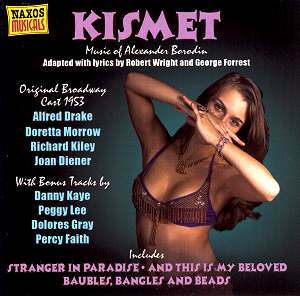 Yes, maybe one sides a little with Brooks Atkinson of the New York Times who noted that "Kismet has not been written. It has been assembled from a storehouse of spare parts." Still, the spare parts are all in working order in this cast recording. Cleverly some contemporaneous recordings are added as a bonus. Peggy Lee turns in a star performance and Ralph Flanagan shows style and class in his outing. The Ross Bagdasarian-Nelson Riddle take on Not Since Nineveh is bursting with baroque self-confidence, and all the better for it. The fine recordings and transfers are complemented by Richard Ouzounian’s droll sleeve notes, making this a top-notch production.